We are a customer service business with a roofing problem. Our belief and commitment to service. Easton Roofing is adept at expertly installing roofing products from many manufacturers. We are experienced and certified to install products by CertainTeed, Lomanco, Malarkey Roofing Products, GAF, IKO, Owens Corning and TAMKO. Easton Roofing has the skills, certifications and equipment to reliably install and repair commercial roofing on any business establishment, whether it is a large office building or a small restaurant. Request a free consultation today. Avoid water damage and potential structural problems by working with Easton Roofing. We’ll help you find the best gutter system for your home and your budget. We’ll never try to sell you something you don’t need. Easton Roofing can help you replace your old attic insulation, reducing your energy bills and increasing your comfort. Talk with a friendly member of our team about accurate and affordable attic insulation removal and replacement. 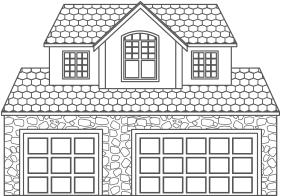 Easton Roofing Company is a full-service roofing, gutter and attic insulation specialist based in Prairie Village, KS. We provide residential roofing, commercial roofing and attic insulation services within the Kansas City metro area and Johnson County, as well as Lawrence, KS. We are committed to using the best products on the market installed by the best roofers in the industry. Whether you need a simple gutter repair or a full roof replacement, you’ve come to the right place. We know there are a lot of roofers in the Kansas City area. So, what sets Easton Roofing apart? Our many satisfied clients would tell you it’s our straightforward approach to customer service. Investing in a new roof, or improving an old roof, can be a stressful experience, especially when you work with a contractor that doesn’t really have your best interest at heart. When you choose Easton Roofing, we’ll never try to sell you something you don’t need, or surprise you with additional charges halfway through the project. We’ll fix your roof, gutters or attic — plain and simple. We’ll treat you like family and your home like it’s ours. If you want honest service and excellent workmanship, choose our company. We’re excited to work with you! Contact us today to get started on your project. Kansas City residents can contact us at (913) 257-5426 and homeowners in Lawrence can reach us at (785) 766-1259. You can also request a free consultation with one of our roofing specialists.